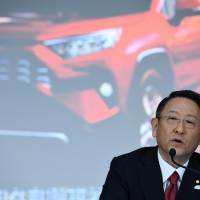 Toyota Motor Corp. announced Wednesday that it booked a record net profit for the last business year, despite uncertainty caused by once-in-a-century changes faced by the automobile industry and rising protectionism. Toyota said its net profit reached ¥2.49 trillion for the business year that ended in March, surging 36.2 percent from a year earlier thanks mostly to the weaker yen and cost cutting. Annual sales jumped 6.5 percent from the previous year to ¥29.4 trillion, also a record high. Operating profit rose 20.3 percent to ¥2.4 trillion. Profit jumped in all regions except for North America, where profits were more than halved by the cost of customer incentives in the local market. Globally the Aichi-based automaker sold a total of 10.44 million units during the period, and it expects to sell 10.5 million units for the following year. 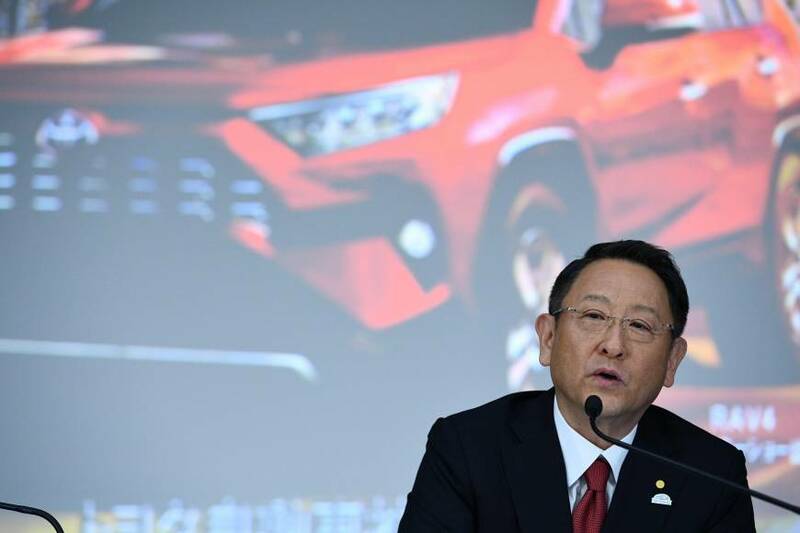 Summing up the brisk performance in the last business year, President Akio Toyoda said the results reflect “the true character” of Toyota’s continuous improvement — known as kaizen. “I believe that the accumulated results of steady, earnest, and thorough cost-reduction efforts, involving everyone, have begun to steadily become apparent in our financial results, little by little,” he said during a news conference after the earnings were released at around 1:30 p.m. The move by the nation’s leading automaker to announce annual financial results before the 3 p.m. close of the Tokyo Stock Exchange bucked convention. Toyoda said the company needs to push forward efforts to further avoid redundancies as the carmaker enters a “life-or-death battle” with technology companies — which he calls the company’s “new rivals” amid the rise of connected cars and autonomous driving. “The more we advance new technologies, such as those related to electrification, automated operation and connectivity, the broader the potential of automobiles will become. This will lead to an era in which Toyota’s strengths can be more fully employed,” he said. Toyota shares finished the day at ¥7,424, up 3.76 percent from the previous close. The share price jumped after the firm announced its financial results in the afternoon. For the current business year, which started in April, Toyota forecasts sales will drop 1.3 percent to ¥29 trillion. It also sees net profit falling 15 percent to ¥2.12 trillion. The strong result came on the heels of continuing pressure from U.S. President Donald Trump, who often cites Japan’s automakers as an example of what he calls “not reciprocal” trade practices between the two countries. Prospects for global trade have also become less predictable after moves by Washington in March to slap tariffs on imports of steel and aluminum products — said to be for the sake of U.S. national security. The policy quickly prompted China to reiterate by imposing tariffs on U.S. goods, raising concerns about a potential trade war. Meanwhile, Honda Motor Co. last month reported its annual net profit surged 71.8 percent to ¥1.06 trillion thanks to reduced corporate tax rates in the U.S.
Nissan Motor Co. is scheduled to announce its annual results on Monday.